In 2003, a small group of Pizza Man fanatics were able to convince Mike the business that had captured Milwaukeean’s hearts (and stomachs ) over the previous 40 years needed to be reborn and our East Side location was built on the corner of Downer and Belleview. 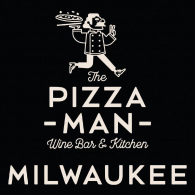 Since then, Pizza Man has grown to three locations, with two new locations in Wauwatosa & Oak Creek, and continue to dish our some of Milwaukee’s most favored pizzas, along with a variety of appetizers & entrees. In addition, they have received national attention for their award winning wine list. All and all, a great place to meet with friends & family to enjoy outstanding food & wine, and now TRIVIA!